This response to Jewish National Fund CEO Russell Robinson has been issued by the following Israeli and American Jewish organizations from among the 36 organizational signatories to the JNF petition: Shatil - Leading Social Change, An Initiative of the New Israel Fund; Rabbis for Human Rights-Israel; Rabbis for Human Rights-North America; Meretz USA; Negev Coexistence Forum for Civil Equality; Hit’habrut-Tarabut – Arab-Jewish Movement for Social and Political Change; Yesh Gvul; the Shalom Center, and the Jewish Alliance for Change. In his response to the petition, JNF CEO Russell Robinson side-steps the main issue: the complicity of JNF—together with its Board of Directors and donors—in dispossessing Bedouin communities of the Negev through its forestation and development campaigns. 1. 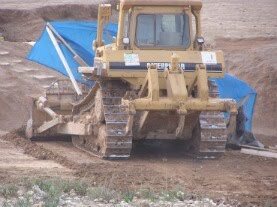 JNF claims that its practice is to plant forests wherever the Government of Israel tells it to—including on top of demolished Bedouin villages. But JNF-Israel (known as JNF-KKL), as the body entrusted exclusively with forestation throughout Israel’s territory, in fact plays a major role in deciding where forests are planted. We call on JNF to publicly state to the Israeli government, and to JNF-KKL, that it will not fund or participate in the forestation or development of any area that is the site of an existing or demolished Bedouin village. 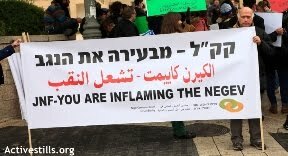 Until it takes a stand against the demolitions and expulsion of Bedouin citizens, and aligns its forestation and development practices with human rights and the universal values enshrined in Israel’s Declaration of Independence, JNF cannot begin to remove the moral stain of complicity in such acts. 2. 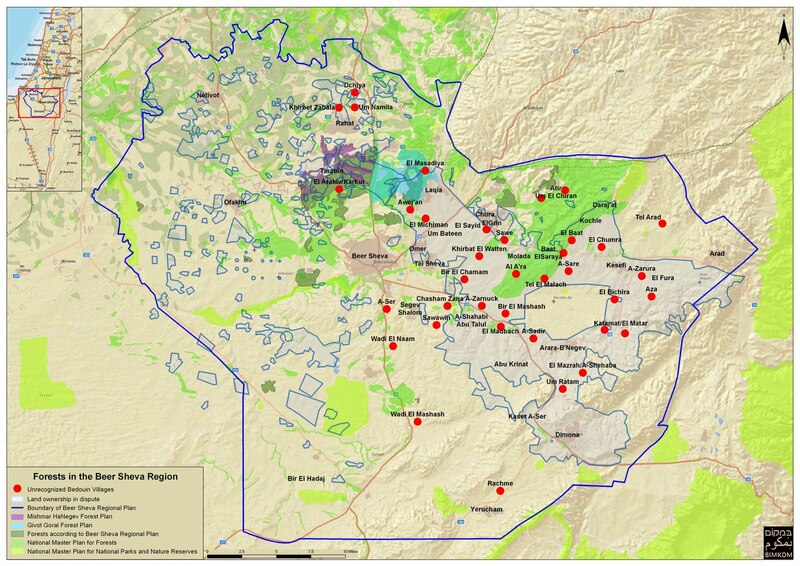 JNF-KKL continues to push through a massive forestation plan intended to double the area of the Destiny Hills forest project from 14,000 to 28,000 dunams. Several Bedouin communities in this area are slated to disappear along with 11,000 dunams of agricultural land. 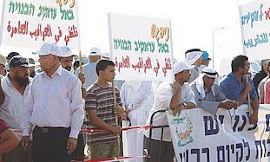 Will JNF oppose the destruction of the Bedouin villages involved in JNF-KKL’s Destiny Hills forest project? Or will JNF continue to support forestation in this area, as the government proceeds to destroy the Bedouin villages there and to uproot its residents? We challenge Mr. Robinson to visit Al-Arakib and the Destiny Hills area to witness the destruction and to explain to the communities concerned that JNF’s American Jewish donors want a forest where Bedouin homes and villages now are. 3. In his response to the petition quoted in JTA, Mr. Robinson claimed that the unrecognized Bedouin villages “cover 60 percent of the Negev,” and that recognizing and developing them would therefore cause “an environmental crisis.” In fact, adding together all of the lands that are claimed by the Bedouin, including those in dispute, the number comes closer to just 6%. 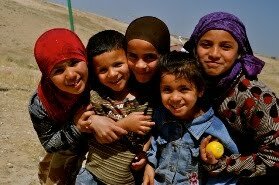 (The Bedouin communities in the entire Negev live on 240,000 dunams, and are seeking to preserve ownership of an additional 450,000; this totals about 700,000 of the Negev’s entire area of 13 million dunams, or less than 6%.) We are dismayed that Mr. Robinson has relied on a serious misstatement of fact to justify an immoral policy. 4. 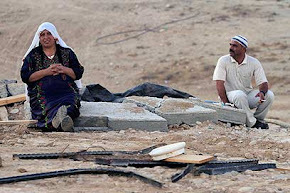 The very day after Mr. Robinson responded to our petition, just two days after the conclusion of JNF’s Annual Conference in Atlanta, the Bedouin village Al-Arakib was completely demolished for the sixth time in three months, leaving hundreds of Israeli citizens again without shelter. What was JNF’s response to this act? Silence. As a self-proclaimed friend of the Bedouin that is working to raise several million dollars to buttress a partnership with one of Israel's minorities, one might have expected JNF to express its distress that a Bedouin village was demolished yet again in an area that JNF has singled out for forestation, and to strongly encourage the Israeli government to resolve the land dispute with Israel’s Bedouin communities through a negotiated agreement rather than by force. 5. Mr. Robinson has challenged our organizations to raise money for Negev development. But fundraising is JNF's mission and expertise. The mission of the organizations who have signed the petition is to safeguard the rights of all Israel’s citizens, to champion justice and equity. Many of them do enormous work on the ground in varied fields such as access to education, community advocacy, women’s rights and other areas. That is why we are calling on JNF to challenge the policies of JNF-KKL and the government, and to truly help the Bedouin, not just with a few projects—however meaningful and important they may be—by funding projects for Israel’s Bedouin citizens at levels proportionate to the size of this community in the Negev, nearly 30% of its population. Mr. Robinson: Don't plant or fund forests that displace Bedouin villages and deprive people of their ancestral lands. Don't let JNF be used to implement the Israeli government's policy of discrimination and destruction. Join with the thousands of Israelis and American Jews who are committed to a sustainable Negev for all its inhabitants, Jews and Arabs alike. Now more than ever - sign the petition to JNF.